Reduce the levels of creative mess that ensues from your next Arts and Crafts class with our 6 Pot Paint Tray. 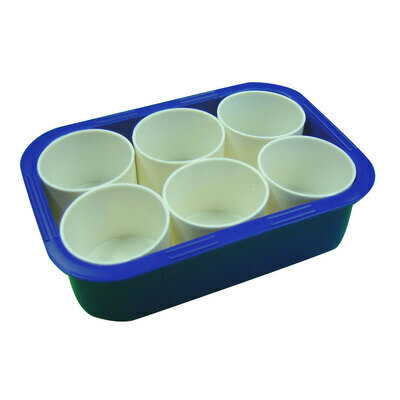 Suitable for use in nurseries and primary schools, this pre-packaged solution features a plastic tray with 6 individual plastic pots. With raised sides all around, this versatile tool reduces the risk of accidental spills while also coming apart easily should each section be needed individually. Ideal for separating up paint colours, storing glues or keeping inks in a secure area, the paint tray is easy to wash and keep clean while the sturdy plastic construction is suitable for heavier handed children. Choose this practical addition and create group-play crafting sessions that are sure to ignite their creativity. Our Arts and Crafts category has everything you'll need to create stunning masterpieces with your class with all manner of products from Paints and Glues through to Assorted Buttons and Assorted Ribbons.